With the recent controversy and chatter over the History Channels DECODED Episode regarding HOW Houdini Died, I thought I'd go in a slightly different direction and follow his body after his passing. We know Houdini died on October 31, 1926 in Detroit Michigan. 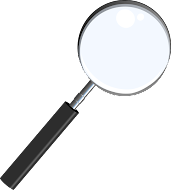 What follows is a description of the events following his death right up until his burial. There are photos of the various places his body stopped along the way and the article concludes with the short 20 second recording of the Houdini Funeral. He died at 1:26 p.m. in Room 401 at Grace Hospital in Detroit. From there his body would have gone to the hospital morgue and then to Wm. R. Hamilton's Funeral Home on 3957 Cass St. 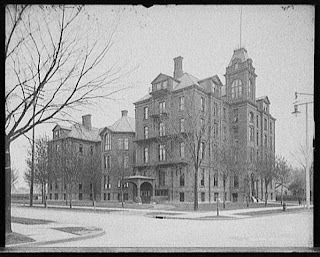 The photo here shows the white house which was the original building for the funeral home and is where Houdini's body would have been. 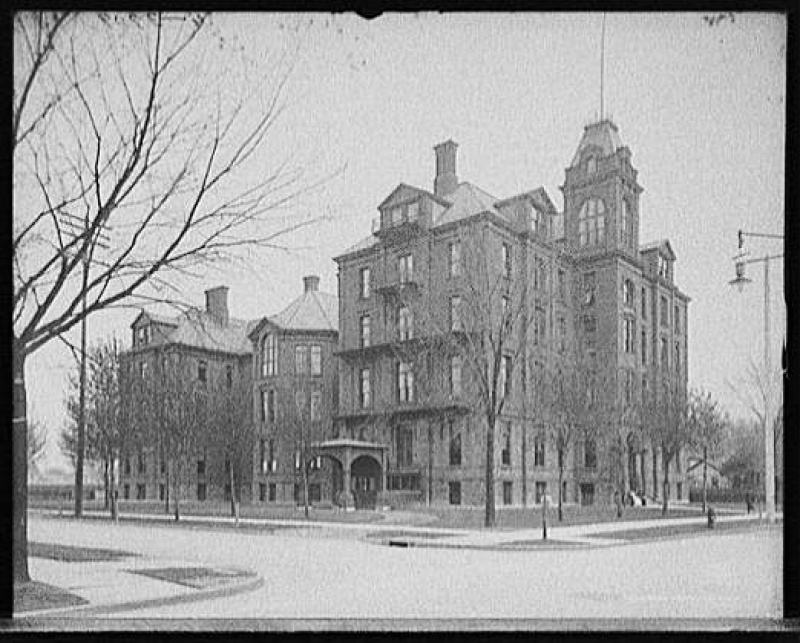 There is a larger brick building connected to it on the left but this was not completed until the 1930s. This is where Houdini was embalmed by John Fraser, one of the employees at the funeral home. While this was happening the Houdini Show and all it's props and equipment were being crated and shipped back to NY. However, oddly, one piece did not make the trip. It was a bronze coffin with a glass lid which Houdini had intended to use for a buried alive stunt during the 1926-27 Tour. After the embalming at Wm.R. Hamilton's Funeral Home his body was put into this coffin and then into the crate for the coffin. Houdini's body now fully crated was taken by truck to the Michigan Central Station. An extra Pullman Car had to be added to the train for Houdini's casket and for his family to travel back home. Newspaper accounts of the time report the body leaving Detroit on the 1st to arrive on the 2nd in the morning at Grand Central Station in NYC. 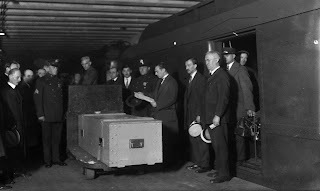 In the photo (left), you can see the crate containing the casket with Houdini's body. One thing I never noticed before was the fellow standing on the far left hand side with his hat in his hand. That is Servais LeRoy, the illusionist and friend of Houdini. In fact, hundreds of people were at the station to see the casket arrive. 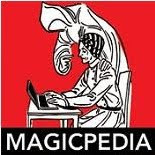 Houdini had been the President of the Society of American Magicians as well as one of the most famous and beloved entertainers in the world, his death came as a shock to everyone. Upon arrival at Grand Central Station, the casket was taken by Samuel Rothschild to his West End Funeral Chapel, 200 West 91st Street. The casket was to remain in state at the funeral parlor until November 4th. There had been talk of having the casket lie in state at the Hippodrome Theatre but this did not happen. A letter Houdini had written several years before was discovered outlining the details of his funeral and they followed his instructions. 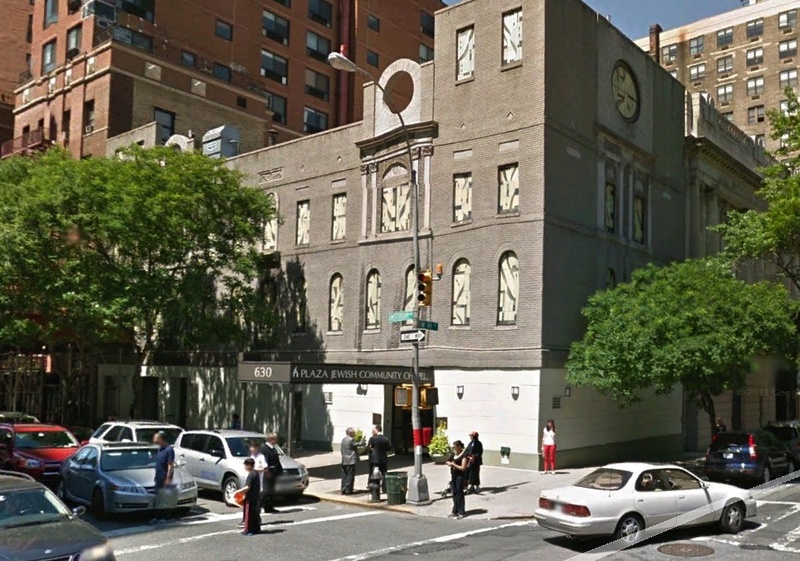 Per Houdini's wishes the funeral would take place at the Elks Clubhouse Lodge No.1 in NYC. According to news reports, thousands of people came by to pay their respects at the funeral parlor. By the way, the photo to the above/right shows the location of the West End Funeral Chapel, but today it is the Plaza Jewish Community Chapel. 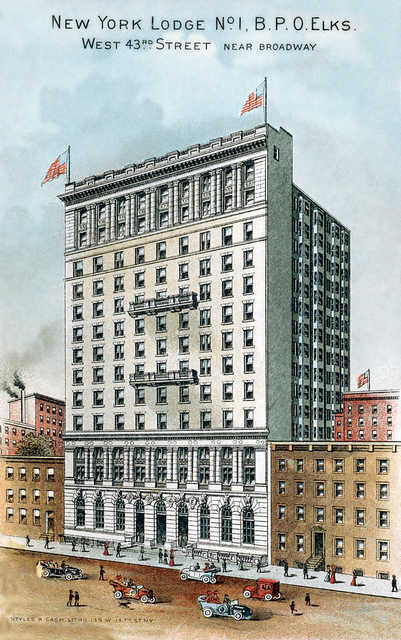 On the morning of November 4th, 1926, the casket made it's second to last stop, this time the Elks Clubhouse on West 43rd near Broadway. It took three cars to move all the flowers from the funeral parlor to the Elks Clubhouse. Houdini would have been proud as the room was packed for his funeral. Close to two thousand people showed up for the service. The service began at 10:30 a.m. and was officiated by Rabbi Bernard Drachman and Rabbi B.A. Tintner. Eulogies and remembrances were given by numerous fraternal groups, magicians and others in the theatrical community. The very first Broken Wand Ceremony was conducted by a member of the Society of American Magicians. This is where a magician breaks a wand to signify that the magic of the deceased individual has ended. It's a great ceremony, but I'm actually not sure how fitting it was for Houdini as his magic kinda continued on, even till today. Kenneth Silverman's book HOUDINI!!! says that Bess held up well until the casket was sealed at which point she broke down in tears. 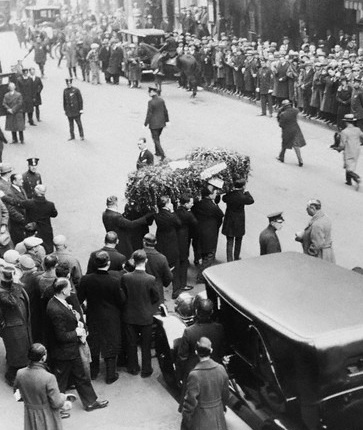 Incidentally, the casket that Houdini's body traveled in from Detroit to NYC was actually a bronze casket liner. It was placed inside a larger casket and the entire thing hermetically sealed before it was carried out to the hearse. 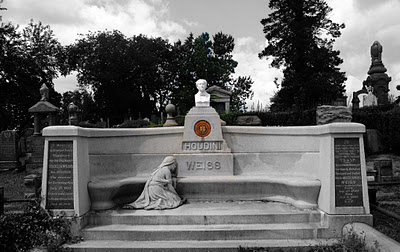 Houdini's male assistants acted as the pallbearers, with some very notable individuals being listed as honorary pallbearers; Martin Beck, his former manager and theatrical impresario, Bernard Gimbel, one of the originators of the Gimbels Dept. Store, William Morris, of the famed entertainment agency, and Adolph Zucker, a film mogul who started Famous Players Film Company which eventually became Paramount Pictures. These were just a few of the high profile names listed as honorary pallbearers. As the casket was carried to the hearse, the mourners could see for the first time that the streets were jammed with 2,000 spectators who had all come out to say their last goodbye to the master of mystery. 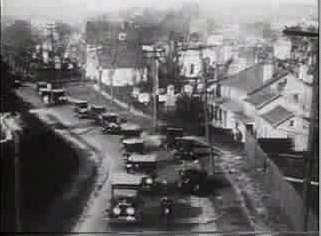 According to The Secret Life of Houdini, the funeral procession to Macapelah Cemetery contained twenty five vehicles. How long it took to travel from the Elks Clubhouse to the cemetery, I do not know. Silverman's book HOUDINI!!! says that the funeral procession was scheduled to drive through the theatrical district before heading to the cemetery. Finally at the cemetery, the two rabbis were present at the grave site as well as Houdini's family and widow Bess and one hundred+ mourners. Houdini made it clear in his final burial instructions that he was to be placed next to his mother. After the final words and prayers were given by the rabbis, the casket was lowered into the ground. According to the Silverman biography, Theo Weiss, Harry's brother tossed a flower onto the lowering casket and as if my magic a shower of flowers were tossed by the grieving graveside friends. This can be seen on the longer 1 minute plus footage of the Houdini Funeral, but I've only seen the shorter video (below). Below is a short 20 second video of footage from the Houdini Funeral. It's obviously second or third generation because of the poor quality. Superb work, Dean. Few details here that are new to me. Thanks. 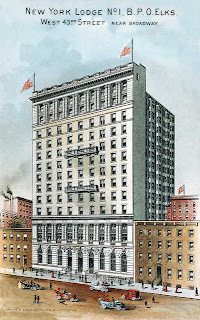 Is their any images of Houdini's Casket laying in the NY Elks Mother Lodge #1 lodge room? To my knowledge there is only one photograph of Houdini in the coffin and I'm afraid I do not know where the photo was taken. My guess is it was probably taken at the funeral home. I'm sure there is probably better footage out there of the funeral procession, but I don't have access to it. Go to Historicvideo.com their is a search bar put Houdinis Funeral and that is the raw footage of Houdini funeral and the quality is great! 3957 Cass Ave., Detroit. The building on the left in the photo, 3975 Cass Ave., is sometimes said to be the funeral home, but it actually wasn't built until 1930. 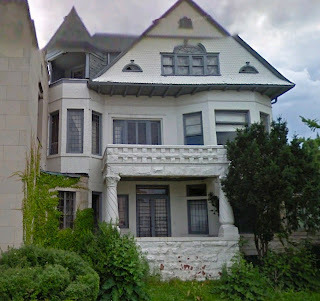 I was at the correct funeral home, 3957 Cass Ave., a few years back, on a tour. It appeared mostly abandoned, at least the front half. I took a bunch of photos and into the windows, but it did seem that it was no longer in use, not surprising for Detroit at all.